Our family returned a few days ago from a fantastic car trip: Chicago, Detroit, Niagara, Toronto, Ottawa, Montreal, Quebec, and ending in western Massachusetts. We saw and learned many new things, and much of it, for me, resonated with current events. My wife, Hannah, was traveling in Eastern Europe for two weeks prior to meeting me and the kids in Chicago, our starting point. With her two cousins, she retraced her family’s roots before her grandfather arrived as an immigrant in Detroit just before the doors to America shut with the enactment of the Immigration Act of 1924. What she found in little towns in Ukraine, Belarus, and Lithuania was the result of the failure of a majority to respect the culture, identity, and ultimately the right to live of a small minority. Where Jews once lived as integral members of communities, all that remains are a few elders and a few dilapidated structures. Sadly, Hannah and her cousins took several long walks across forests and meadows to reach ravines, into which the victims of prejudice – men, women, and children, including Hannah’s [great grandmother] – were forced to give up their lives to hateful murderers. Hannah’s grandfather, Norman Shulevitz, managed to get out of this cauldron and began his life in Detroit with $25. When that quickly ran out, he ate food scraps from garbage. Almost 100 years later, he has left many successful, accomplished, and contributing children, grandchildren, and great grandchildren. His granddaughter and two great grandchildren, my children Abby and August, began our own journey through the Great Lakes region in Chicago. Chicago is today in the very vanguard of the transformation of American cities, a transformation characterized by an explosive and dynamic re-birth of the central city, after having been abandoned for the suburbs starting in the 1950’s. Now, construction of residential and commercial high rises, new restaurants, new parks, and an electric summer vibe makes Chicago a major destination for young people seeking work and companies seeking to employ them. Chicago is consistently ranked one of the top places for workers and companies. Young generations want to live near each other, and they want to be entertained by their city. Chicago is meeting that demand. Legendary for its architecture, Chicago’s skyline gleams and astonishes. We spent days walking and sightseeing. I had a good meeting at Morningstar. Chicago, of course, suffers from ongoing poverty and race discrimination especially on its South Side. But the city possesses an extraordinarily vibrant core that gives me hope that it will in time solve these problems. We drove across Southern Michigan to reach Detroit. The Michigan countryside is lovely, with well-kept fields and farms, and stands of forest all along the way. 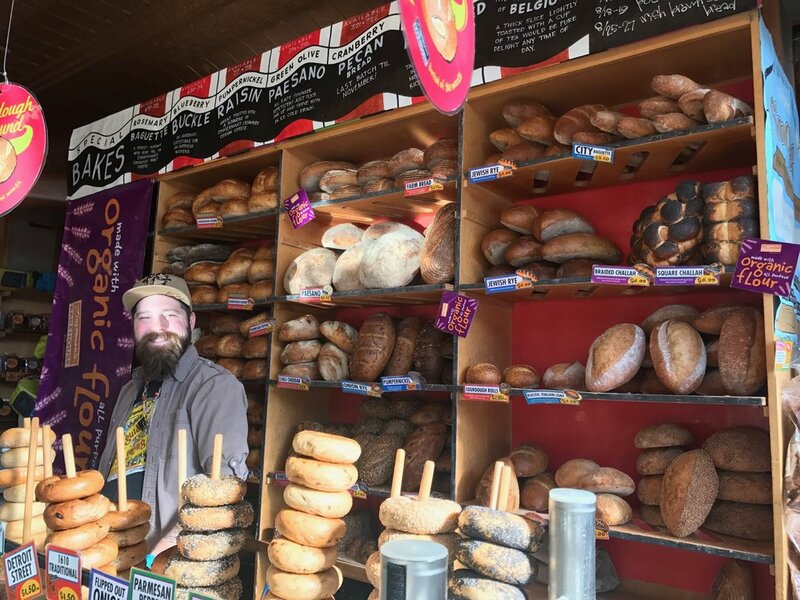 We stopped in Ann Arbor, home to the University of Michigan, and enjoyed sandwiches at world famous Zingerman’s deli, before arriving in Detroit. The lodgings I arranged for were in an Airbnb apartment in one of the many blighted areas of the central city. A young couple had purchased this property and fixed it up. A wonderful missionary family lived below, after having left Boise Idaho a year ago seeking a challenging experience to use their faith. 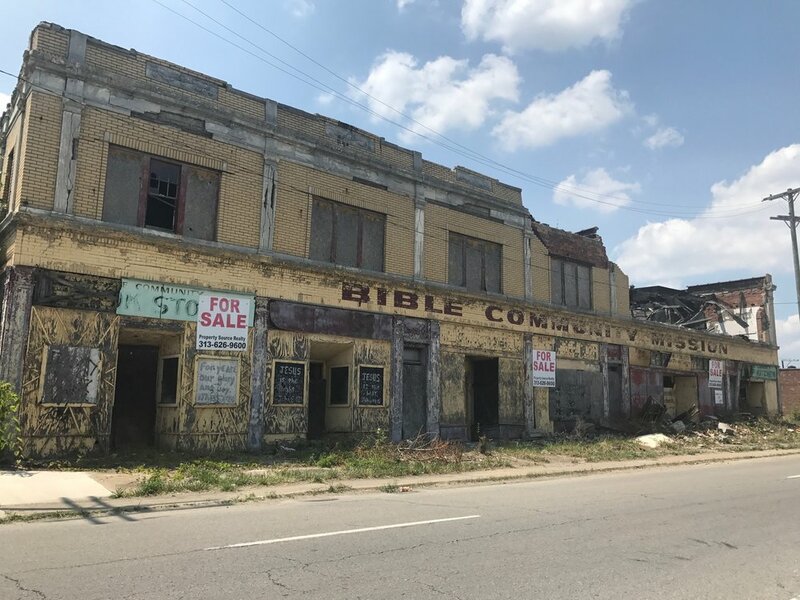 From this neighborhood, we got a sense of the ongoing trauma of Detroit: the 1967 riots, the ensuing white flight to the suburbs, the massive and catastrophic job losses in the automotive industry, all culminating in the literal disintegration of Detroit’s urban core. We were staggered by the sheer quantity of vacant lots, skeletal homes and buildings, and boarded up commercial strips. And many told us this was far better than several years ago. Detroit is the American city with the largest percentage black population – almost 85%. In the mid 1800’s the city was code-named “Midnight” by the Underground Railroad, and was where slaves were smuggled across the Detroit River and into Canada to freedom. In the early 1900’s it was where Southern blacks flocked to find jobs and leave behind Jim Crow. It was where the sounds of the blues, jazz, and pop came together in the incomparable sounds of Motown. And it is where the pain of the African American experience in America has been both left behind and maintained, both triumph and tragedy. We were proud to visit Detroit, and we encourage others to go also to see the Ford Rouge plant in action building F-150 trucks, the extraordinary Henry Ford Museum, and the period settings of Greenfield Village, among others. I am planning to see Katherine Bigelow’s new film Detroit, and if it is as good as her previous The Hurt Locker and Zero Dark Thirty, it will be good indeed. There are signs of rebirth in Detroit. Downtown is renovating like other American cities; young people are moving there attracted to the low real estate prices; dilapidated structures are being removed; the auto industry has stabilized after the catharsis of 2008. Detroit sits in an extraordinarily bountiful location: surrounded by natural landscapes perfect for farming, blessed with an infinite water supply, it is our busiest commercial border with Canada, with trucks lining up with us at the border to enter Windsor, Ontario. We crossed the Detroit River into Canada and immediately saw mile after mile of wind turbines as far as the eye could see. Our drive took us to see the extraordinary power of Niagara Falls, though it wasn’t simple to ignore the commercialization all around one of the world’s extraordinary natural wonders. We enjoyed the charming town of Niagara On the Lake, started by American Loyalists who left an American Revolution that they felt was treasonous to their King. We took in the charms of Toronto, a financial powerhouse and famous for its ethnic diversity and inclusiveness – the dinner we had in Chinatown was wonderful. Ottawa is the national capital of Canada, and I cannot recommend enough a visit there. It sits on the Ottawa River, the boundary between English speaking Ontario and French speaking Quebec, and it graciously avoids taking sides: we were constantly greeted with “Good day bon jour” – all one sentence, no division, you answer in your language of choice and so the conversation will go. At midday an endless expanse of spandex clad did yoga in front of the gorgeous Parliament, noted for its Peace Clock Tower. Ottawa is a city that teaches the world how to accept separate cultures. Montreal, a city I have visited twice before and loved from the first minute, was bursting with energy, with its famous street festivals and café culture. This French speaking city has within it a historic Anglophone community, descended from those who fled the violent American Revolution and other immigrants who arrived later. Montreal is a stylish and urbane capital, with 50,000 people working in the fashion industry; it is also the world’s largest grain port, passing the bounty of Canada’s vast interior on to the world. We got very lucky: the Formula E Grand Prix racing circuit of all electric cars, took place while we were there and we got great seats to see exciting professional racing without the loud engines and fumes, taking place right in the streets. The Old City of Quebec is the only remaining walled city in North America, and is rightfully a UNESCO World Heritage City. Its cobble streets lined with cafes and galleries are one of the most romantic places in North America. Not only is it beautiful, but it is extraordinary historical: it is the place where French dominance in the Great Lakes was built, and also where it was lost, in an astounding 20 minutes, to the British in the Battle of the Plains of Abraham. In a few minutes in 1759, over 250 years ago, 60,000 residents of New France – farmers, tradesmen, trappers, traders, clergy, women, children – suddenly became subjects of the King of England. They have remained so since then, not always happy about it, but calculating that the benefits of civility, integration, cooperation, partnership, and peace outweigh the costs. Indeed, though they are different, they have been permitted to retain their culture, language, religion, and ways. Quebec is a place to go to see how a minority peacefully and productively stakes it claim in the world, and how a majority dominion gives it the air and space it needs to be free and live. We crossed the border into Vermont, a gorgeous place, had lunch with some good friends and clients in Williamstown, MA, and ended our trip visiting Amherst College where I went to college, and Smith College, where Hannah obtained her graduate degree. Despite the belief among (too) many these days that colleges and universities are “counterproductive”, I’ll be very happy if my kids attend either of these. We had pizza at the best – Joe’s Pizza in Northampton. We returned our rented VW Jetta and flew back on Southwest. Our trip took us through the incredibly vital Great Lakes and St. Lawrence waterways. Incredibly, they began to be formed only 14,000 years ago, practically yesterday in geologic time, when Ice Age glaciers retreated during a time of great climate warming, ushering in the modern climate age. 99% of the water in the Great Lakes remains from the melt of those glaciers. The region is bountiful in minerals, fresh water, farmland, cities, and industrious and courteous people, regardless of which side of the border. While a number of cities – Detroit, Buffalo, Rochester – have experienced hard times, they are coming back fast given their extraordinary advantages. Canada is a country the size of Russia with the population size of California, and I can report that I found its civility and politeness to be the biggest respite from the pervasive ugliness often present in the United States. We can learn a lot from our neighbors to the north. We can learn a lot from the rest of the world. The rest of the world is not an unexceptional mass, but a deep resource available for our learning, and our investment. And invest we do, all over the world. In 2017, that is paying dividends and then some. Your international stock holdings are up about 20% year to date, versus 8% for your US stock holdings. Of that 20%, approximately 10% is from returns on the investments themselves; the other 10% is from the rapid depreciation of the US dollar against foreign currencies since President Trump’s inauguration. While no one can make accurate predictions about the future direction of currency rates, Todd Centurino, our new Chief Investment Officer, and I expect that this trend may well continue. We are getting strong attendance response for our October 26 conference. We have been working on so many new initiatives here at New Capital, and I hope to have the chance to present them to you in person then.